Pininfarina has built up a lot of experience in the area of research into small, urban transport vehicles; its realised projects include the Metrocube (top) in 1999, Nido (middle) in 2004 and Etabeta in 1996. Pininfarina will begin converting its San Giorgio plant to produce the electric car it is developing in partnership with the Bolloré Group and which it plans to market in Europe, Japan and the United States, reported Automotive News Europe this week. “By the end of the year, production of the Alfa Romeo Spider and Brera will move from San Giorgio to Bairo,” Pininfarina CEO Sergio Angori told Automotive News Europe. The Bairo factory currently assembles the Mitsubishi Colt CZC and the Ford Focus coupé-cabriolet and comfortably has the capacity to absorb the low-volume production demanded by the two Alfa Romeo models. 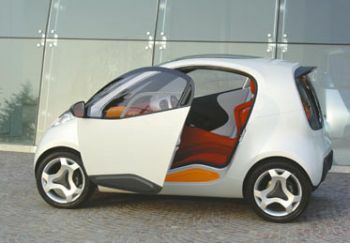 Angori added that pre-production versions of the electric 'city' car will be built towards the end of next year before full production gets underway in September 2010. Around 2,000 units will be built that year with full annual production of 15,000 units being reached during 2013. The car is a 50-50 joint venture between Pininfarina, which has built up a lot of knowledge in the research and development of compact city transportation vehicles, and the 6 billion euro valued French industrial conglomerate, Bolloré Group, which is a world-leader in battery technology. The car will be branded and sold across the world under the Pininfarina name. The as yet-unnamed car, which will be the result of a 150 million euro investment by the two partners, will debut in concept car form at the Paris Motor Show in October. The production version will debut in March 2009 at the Geneva motor show said ANE. The new four-seat electric car, which is set to bring completely new levels of comfort and usability to this growing segment, will have a normal range of 155 miles and a product life cycle of over 124,000 miles. As with most other electric cars it will be rechargable via a normal household electrical socket, with a 5-hour charge time, although a quick five minute charge will carry it 15 miles. The Pininfarina electric car is expected to be priced at more than 15,000 euros. This price most likely will not include batteries, which are to be leased-adds ANE. The car will feature battery technology that Bolloré has been developing over the past 15 years. Bolloré’s lithium metal polymer technology differs from traditional lithium-ion technology. Each battery cell is electronically protected by passive and active systems, which constantly monitor operating efficiency, voltage and temperature of each element. The cells are also encased in a steel container to prevent damage, concludes the newspaper.